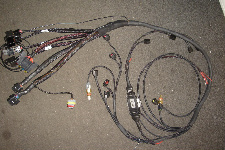 We specialize in producing custom automotive engine harnesses for performance standalone engine management systems. When it is time to re- wire a customer’s vehicle, extensive planning and effort is made to hide as much of the harness as possible. All wiring is covered and were visible is always very neatly displayed, with fray resistant braided wiring loom and small amounts of heat shrink tubing. We use new factory connectors when available and crimp each new pin to assure the best conductivity for its designated plug. Each Harness is made to the customer’s specification which allows the individual to add or subtract whatever wiring they deem necessary to fulfill their applications needs.